Well it was scan day today so it was up early and set off for the Marsden. The weather was wonderful and sunny so we were very happy and relaxed. As it was half term in the schools the traffic was so clear and we sailed through. 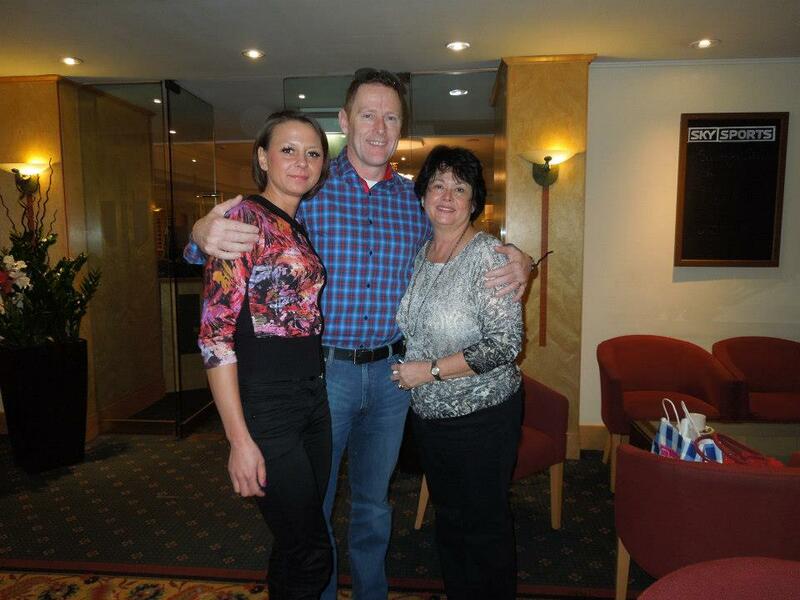 I was meeting James and Carol Homersham as they were travelling all the way from Suffolk. James has been so ill and we Mesowarriors have been worried about him But he has recovered after having Radiotherapy on his Esophagus with success and it has shrunk a tumour there. 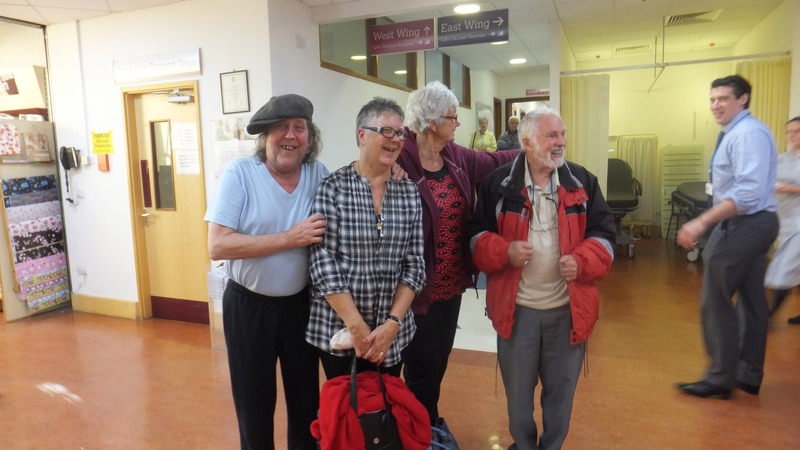 So He has been sent an appointment by the Royal Marsden and Jim was excited to see what they were going to offer. We parked the car and walked down the hill to the front door when a lady in a car asked Ray ” Is that Mavis are you Ray” Love it, the joys of Facebook. When you meet you are friends and we have been through so much together. We all hugged and cuddled and then walked into the hospital. I went to have blood tests as my Doctor had emailed to say she has a theory why I almost passed out on Tuesday with low blood sugar. I waited in the waiting room until they could fit me in and then they took so many files of blood (after putting in loads of flashes as my PICC line wouldn’t give.) but the last two were very special ones and had to be taken before 10.30 ??? and then passed down and had to be tested within half an hour of taking from my body ??? So with the blood taken I could go for my scan. I met a lovely young woman in the waiting room. Her husband was blind. While he went to have a cannula put in. We chatted and he has had Kidney cancer. They took the kidney out 2 years ago and he has been doing really well since. Just a check up scan. So happy for him. It was my turn to, guess what ?,have my PICC line flushed again So I passed for the contrast to run in through my veins. I then was taken down stairs to the scanner to be delivered to the waiting room there. I didnt wait long and I was called in. The scan went Ok and I was finished I thought. No! back to see the doctor. He welcomed me and asked how I felt. The problem was only Tuesday when my head felt like it was in a vice as I changed the bedding. Ray made me a sugared coffee. He told me all my bloods are good apart from the 2 special ones the result will be tomorrow for those. That made me smile. So I will try that in the mornings with my breakfast and see if boosting my sugar intake helps. He said also my scan was on the computer but he will read it and talk to me Tuesday. I said I just want to get over the 50% shrinkage. I couldn’t tell him the Antibiotics I was on from the GP. Im very naughty like that so I said I would bring the box on Tuesday. Then I said that I was given Sudafed for the soreness the water infection was causing. Err they are a decongestant,I had meant Sudacream. He looked on WIKI and found that was for nappy rash. That made him smile. We were free to go then. 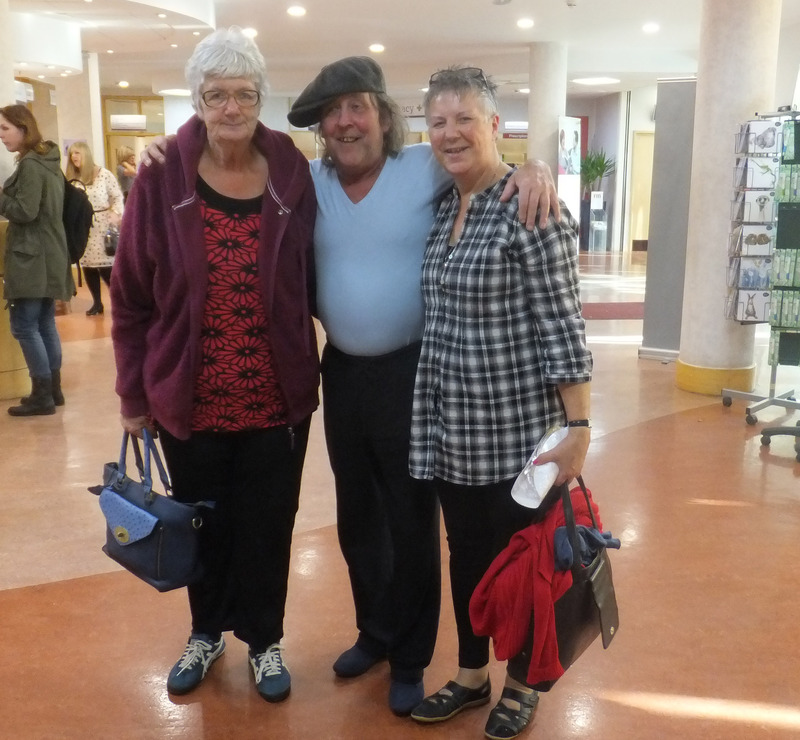 Back into the lift and off to the Cafe I bumped into Carol and Jim and they were so happy. they had a great sit down with the Doctor and Jim was offered a New trial. He wont know for 2 weeks just what but thats it he is settled with the Royal Marsden. We had a party with cake and coffee and a talk about everything. All good things come to an end and we had to both leave. But as we walked into the Reception area Ray remembered his camera and we took Photos. A Doctor passed and asked if he could take but Jim had already asked another nice man. So I made the Dodc line up with us. I said come on we love Doctors. He worriedly asked where it was going and I replied Facebook everything goes on Facebook. Im accosting the Doctor as he passes. The second half of my blog is to share something that happened. I have received today a wonderful email. The conference went well and the reactions on your video were very good! In the attachment you can see the picture of your video during the conference. Multiple people told me that they attend conferences every so often and that all the conferences are normally focused on rules and regulations en techniques for removing asbestos safely. Mesothelioma is never talked about, while this is the most important reason for all the rules and regulations! Your video changed this for a lot of professionals yesterday. Now instead of only talking about rules and techniques people also talked and thought about the underlying reasons, this was of great value for the conference! So again: thank you very much for making the video presentation! I hope you have a lovely weekend! I find that really great that my first European Speech has touched so many people and has in fact given such a powerful message of what it is like for a Patient and what they should be doing to make sure this madness stops. Why so many people are dying because of contact with Asbestos. C. European policy: what are you waiting for? The building registry: Directive to legal status? Everything you need to know if building owner! The 12th International Conference of the International Mesothelioma Interest Group 2014 (IMIG 2014) took place in Cape Town, South Africa on October 21-24, 2014.1 Despite the rather remote location, hundreds of clinicians, researchers, academics, scientists and others took part in proceedings which included plenary presentations, workshops and poster discussions. Features which were added to this year’s event included a social advocacy panel and exhibitions by local community activists from former asbestos mining areas engulfed by a deadly legacy which endangers the health of all those who live, work and visit the areas. IMIG2014 Chair Dr. Jim te WaterNaude opens the conference. From rather small beginnings, IMIG has grown to be recognized as the premier biennial calendar fixture for mesothelioma experts. 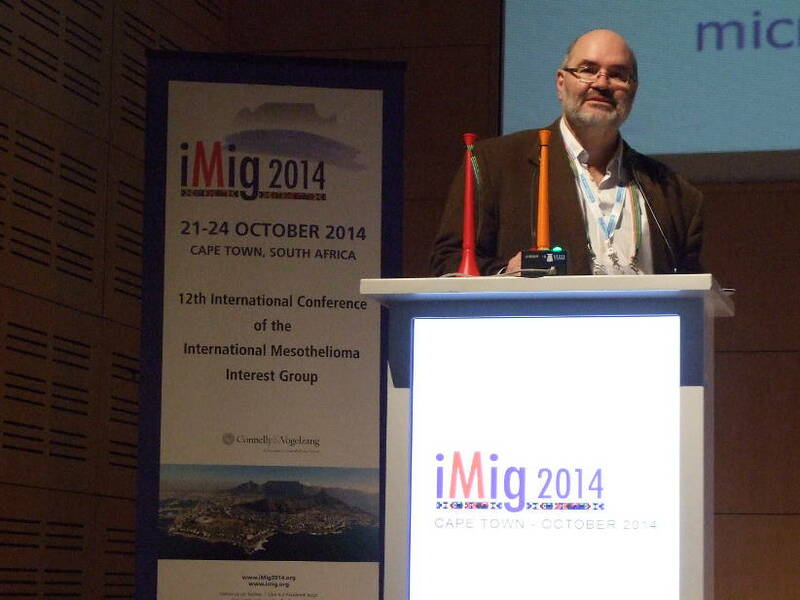 The success of the IMIG event was this year underscored by the presence at the meeting in Cape Town of a U.S. toxicologist David Bernstein who has undertaken commissions for Canadian, Brazilian, U.S. and other asbestos stakeholders. He was not the only asbestos industry delegate at IMIG. Dr Markus Heitz from Becon (Switzerland) also attended; Becon is the holding company for the Swiss Eternit company. Also present was a former employee of Everite, a South African asbestos-cement company which in 2002 made the transition to asbestos-free technology. It is pertinent to note that the abstract Bernstein submitted for consideration by the IMIG organizers did not include an acknowledgement of industry support. The 160+ oral presentations, 30 poster discussions and 150 posters over the three day event covered mesothelioma developments in epidemiology, immunotherapy, surgery, preclinical trials, personalized therapy, radiotherapy, pathology, immunology, molecular therapy, imaging, multimodality treatments, molecular genetics, biomarkers, novel therapeutics, social advocacy, nursing and supportive care. Reflecting on IMIG2014, incoming IMIG President Professor Dean Fennell noted the lack of progress in treatment options over the last twelve years and welcomed “the signals for new approaches to treatments” reported in Cape Town.2 He highlighted exciting developments reported by IMIG speakers in neoadjuvant therapy, immunology and antibody research, emphasizing the need to develop a standard of care for patients in the relapse setting. Data awaited from recently completed UK randomized trials in the 2nd line setting might inform this discussion. 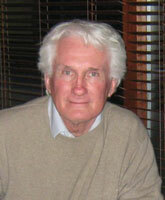 It is relevant to note that Professor Peto is part of a controversial research initiative – Historical cohort study of cancer mortality following exposure to chrysotile asbestos at the Uralasbest plant in Asbest, Russian Federation – mounted by personnel from the International Agency for Research on Cancer (IARC) and Russian scientists with proven links to asbestos vested interests.3 At the October 23 epidemiology session, Dr. Jock McCulloch’s presentation: Asbestos Blues: A History of Asbestos Mining in South Africa contained evidence of the corruption of asbestos science. Checks issued by the U.S. law firm of Nelson, Mullins, Riley & Scarborough, representing asbestos defendants, to Dr. Christopher Wagner, the scientist widely credited with having discovered the relationship between pleural mesothelioma and asbestos exposure, were shown. Thankyou Laurie for letting me share the conference here. 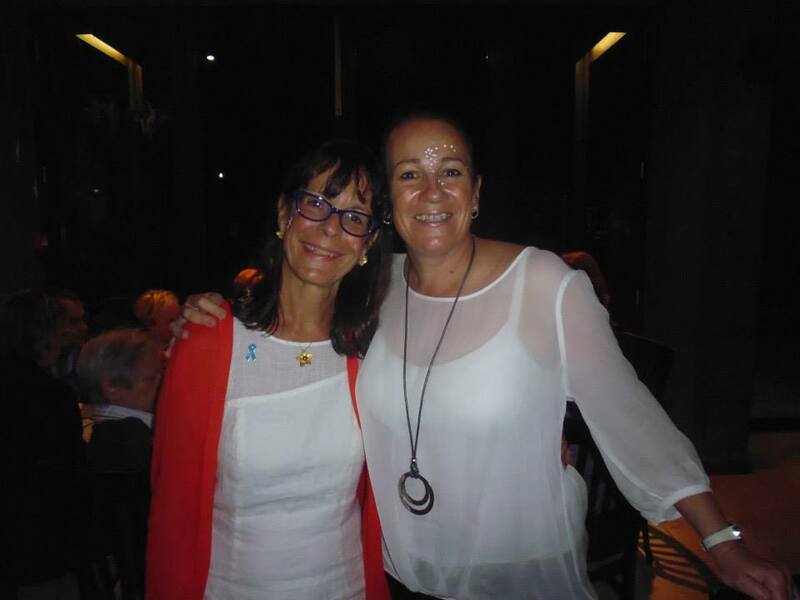 To help all those who would have liked to have attended her is the iMIG write ups which I have found so very interesting as they are packed with information on all levels of Mesothelioma. In the opening plenary session of iMig 2014, Dr. Jim te Water Naudé and Dr. Steven Mutsaers welcomed close to 300 healthcare professionals to Cape Town, South Africa. It’s an impressive number of attendees for this somewhat remote but beautiful venue and given iMig’s membership of around 500 members. The assembled group comprises the finest minds in mesothelioma related research, treatment, and advocacy from around the world. It’s quickly evinced as a heavily scientific affair with a fun spirit as Dr. te Water Naudé jokingly threatens to use a vuvuzela horn on speakers who defy their time restrictions. The initial plenary session focused on several areas of interest to the broad range of delegates traveling to iMig. The opening plenary speakers’ presentations are outlined below as are several key presentations chosen by iMig peers as the “Best of iMig 2014”. Australia and South Africa are the only countries to have mined crocidolite or blue asbestos. Crocidolite was mined in the Northern Cape for one hundred years and at Wittenoom in Western Australia from 1944 until 1966. Mining has left a pandemic of asbestos disease in the Northern Cape and although production levels were modest, Wittenoom has become the site of Australia’s worst occupational health disaster. The mines of the Northern Cape also supplied the first conclusive evidence linking asbestos to mesothelioma, but discovery had no impact on the global consumption of asbestos. Corruption is a serious problem in communities burdened by asbestos-related disease and this has justifiably bred profound mistrust of outsiders involved in asbestos compensation, research, or litigation. This corruption has involved both suppression and destruction of knowledge and this has been one of the most effective strategies employed by the asbestos industry. The history of suppression of information documenting the dangers of asbestos exposure dates back to the 1930’s when the work of George Slade demonstrating the health effects of asbestos exposure in miners was suppressed and ultimately destroyed. These actions contributed to the absence of any regulation at all of asbestos mining in South Africa until 1955. In the United States, the asbestos industry actually paid researchers to claim that asbestos was not significantly associated with mesothelioma. Corruption of science slows regulatory legislation and limits the success of litigation aimed at compensating victims. iMig 2014 brought together nearly 300 scientists, clinicians, and patient advocates from around the world to Cape Town for 4 exciting days that included nearly 350 platform and poster presentations. The meeting provided a forum for sharing information about new technologies, the latest basic and clinical research findings, and how we can join together to help patients with this disease and educate all about the dangers of asbestos exposure. This international conference was a great success and continues the work of iMig aimed at understanding and ultimately preventing and defeating mesothelioma. Living With Mesothelioma-My Diary- Wardrobe clear out day. Got up yesterday with a plan. To have another clear out of my wardrobe. I have been internet shopping for a new wardrobe ans as I have a couple of parties in my diary and Christmas on the horizon I have treated me. I have let buying clothes a lesser priority as I didnt have a future but Im coming to terms with the fact I might go on now that the drug is working so well. I have for almost 6 years been thinking only of dieing. I can now think differently. So I have emptied out some clothes and we took them to the charity bins in the carpark at Tankerton. Mind you it started raining as we walked the dog from the car park and we got soaked. Wonderful fine warm rain. When we got in the phone was ringing and my Doctor from The Royal Marsden said that she really has been having a think about my blood sugar dropping in and out, she wants me to have a blood test when I go on Friday for my scan. She didn’t explain what her thoughts are only that she will tell me on Tuesday when I see her again. Then the door bell went and the guy from the chemist passed over my prescription. 14 Nitrofurantoin 100mg capsules —To reduce the development of drug-resistant bacteria and maintain the effectiveness of nitrofurantoin macrocrystals capsules and other antibacterial drugs, nitrofurantoin macrocrystals capsules should be used only to treat or prevent infections that are proven or strongly suspected to be caused by bacteria. Nitrofurantoin macrocrystals is an antibacterial agent for specific urinary tract infections. So it would seem Im in the superbug range of things. I dont like that. I have visited hospitals so many times in 6 years that I suppose it was bound to happen. I already think cleanliness and this is really making me go over the top. Using wet wipes everywhere and washing my hands and surfaces. From there the evening was uneventful just spent chatting on Facebook. I haven’t slept much over night. Laying awake tossing and turning and shot the dog off the bed, poor thing. So Im up and hope I might get a power nap later on. An RAF spokesman said: “Typhoon aircraft were launched this afternoon from RAF Coningsby to intercept a civilian aircraft south of London which was causing concern to air traffic control authorities. 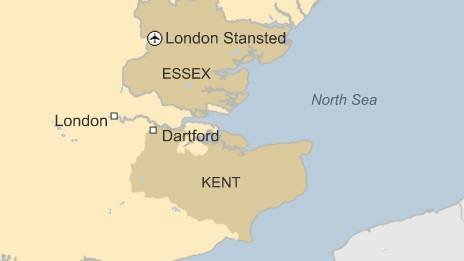 “The aircraft was safely escorted to London Stansted. The RAF confirmed the aircraft was a Russian-made Antonov An-26. 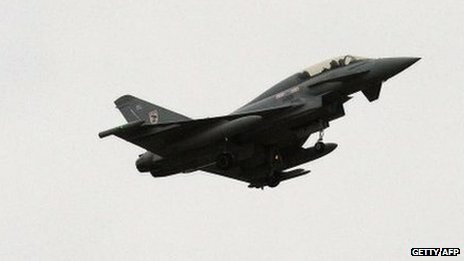 It apologised if crews had “startled people” but added that jets only went supersonic over land when absolutely necessary. A friend in Sidcup says — The noise was unbelievable-whole house shook. Im so mad I didn’t see this I love Military planes and miss not going to Farnborough airshow. As a child I went every year with my parents in the motorbike and sidecar and I carried on the tradition over the years until they stopped the shows. I love it when they fly low on maneuvers over here in Seasalter. Got up yesterday and felt fine but as I made the beds my blood sugar dropped to the floor. I was sweating and felt like my head was caving in with a tight band around it. Oh dear !!! Ray made me a sweet coffee and I ate a biscuit and sat around, I had no energy from then on. Wandering wether I out to phone the Doctor I had a phone call from the Royal Marsden. The Doctor told me that my water infection was ok when testing but when they grew it the bug was still there She emailed the report to me and to my GP. Enterococci are intrinsically resistant to cephaloporins and ciprofloxacin and these antibiotics should not be used in their treatment. Vancomycin resistance is acquired when a sensitive Enterococcus acquires a special piece of DNA called a plasmid that permits the bacteria to become resistant to vancomycin. The new strains are called vancomycin-resistant enterococci (VRE). One concern is that VRE strains appear able to transfer vancomycin resistance to unrelated bacteria such as MRSA(methicillin-resistant Staphylococcus aureus) and these strains are renamed VRSA. In addition, VRE organisms, like MRSA, are usually resistant to more than one antibiotic. VRE can be spread from person to person and are an increasing problem in hospitals and chronic-care facilities. Approximately 30% of all enterococcal infections are now caused by vancomycin-resistant strains (VRE). Caused by a low Immune system. Seeing that this can be contacted through hospitals worried me so Ray ordered bottles of sanitisers like you have in hospital and we will have them around the house from now on. I use wipes and gels but with my low Immune system we thought it was best. The drug may have turned my Immune system on but I dont know o what extent. My GP emailed to say he had put the prescription into the chemist for me so that will be delivered today. What great service. It must save him time to be able to do it by email than have people in the surgery. I love this modern approach to the NHS. I have porridge this morning for breakfast and will eat healthy to combat any problems I might be having. Brown bread for lunch and Jacket potato for dinner. I stayed in all day as I had lost energy to face a long walk so Ray did all the dog walking. Today I just feel like a cold coming maybe thats the problem. This week, a notification was sent to investigators on the DETERMINE Trial that accrual will be completed by the end of October. DETERMINE is an international, randomized trial comparing treatment with an immunotherapy drug called tremelimumab to treatment with placebo as second or third line therapy in patients with malignant mesothelioma. The trial opened in May, 2013, and in just 17 months will have enrolled 542 patients! This is a notable achievement. To put this in perspective, the last phase III of this magnitude testing vorinostat in a comparable group of patients (VANTAGE Trial) took 5 1/2 years to enroll 660 patients. There are differences between these two trials that could have accounted, in part, to the more rapid accrual. In DETERMINE, 2/3 of the patients receive the study drug, 1/3 get placebo, while in VANTAGE it was half and half. Also, immunotherapy drugs such as tremelimumab have garnered tremendous excitement in the oncology field due to their promising results in numerous cancers such as melanoma skin cancer and lung cancer. Yet, despite these differences, this accomplishment of completing a trial of this size in such a short period time should be a wake-up call to the pharmaceutical industry. Historically, drug companies have been reluctant to undertake large trials in mesothelioma due to concerns about feasibility and slow accrual. But this trial demonstrates the potential. Patients with mesothelioma urgently need better treatments, and with only one chemotherapy regimen approved, there is a tremendous opportunity to impact the outcomes for these patients. So here is the message to pharma: Large trials in mesothelioma are possible, and the community of patients with mesothelioma is eager to participate. Lee M. Krug, MD, is an Associate Attending Physician in the Division of Thoracic Oncology, Department of Medicine at Memorial Sloan-Kettering Cancer Center in New York, New York where he completed a fellowship and chief fellowship in medical oncology. Dr. Krug is the Director of the Mesothelioma Program at Memorial Sloan-Kettering Cancer Center. Read more about Dr. Krug’s work here. We need to get our NHS to read this so I hope all the Doctors and Nurses that read my blog will take note and take this thought into their meetings and conferences. This is what Lord Saatchi and I talked about when he introduced his Bill. We the patient are willing to try the trials no matter what as we have nothing to loose and we sign to say we wont sue anyway. Just give us more chances. The ceramic Poppies have been placed in the moat of the tower of London. How wonderful that they have sold them all. We are delighted to announce that we have sold all the poppies. We do realise that this news may be a disappointment for those unable to purchase one of these unique pieces of art. We will be confirming orders in the next few days and should any further poppies become available we will put details on our website. We got all showered and dressed and with the dog walked we set off to Blue Water for my date. We arrived early so we do some Christmas Shopping before meeting Chris Ward Director of Award Health & Safety Ltd.
You can walk miles and miles in these shopping Malls and you can spend a small fortune. We sat doen outside John Lewis and Ray went for a coffee when across the room came Chris, all smiles and we had a good welcoming hug. I told him go and tell Ray what you want, which he did and then came and sat by me. We ghad a lon long chat about everything and I was so pleased to hear how busy he is. He has a full diary of Training sessions. Award Health & Safety Ltd are an Award winning ‘Highly Commended’ Small Business of the Year, in the Portsmouth Business Excellence Awards 2010 & 2011, Trading Standards Approved, health & safety consultants that offer a full health and safety advice service. Everything from a broad range of safety audits, to health and safety training, Corporate Manslaughter Awareness Training, Fire Safety Awareness Training in English or Polish with all the required health and safety documentation. Our full range of Asbestos services include asbestos surveys & asbestos management IATP approved asbestos awareness training. A fully licensed asbestos removal service can be arranged if required. 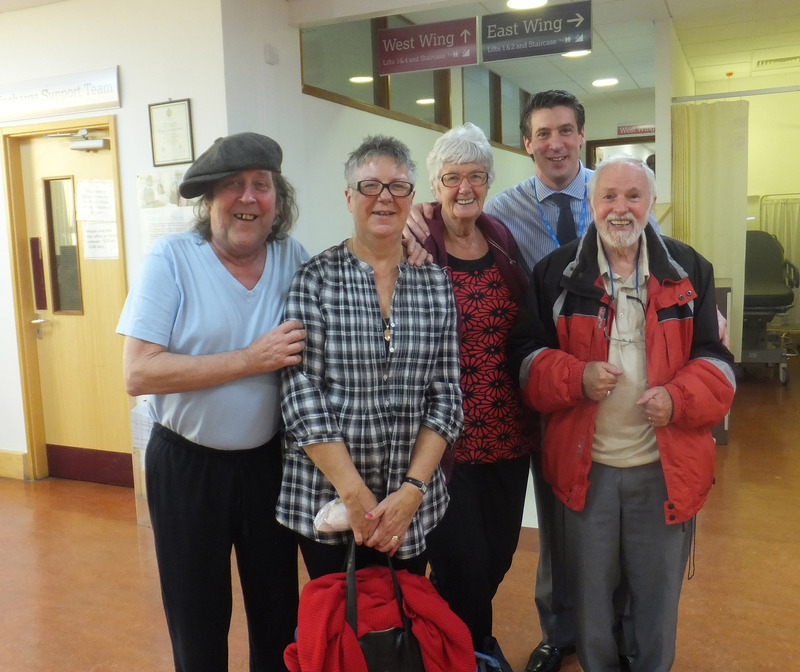 Chris showed me some of his presentations and there is photos of me and Ray, as he he said people say they cant believe taking the Asbestos dust bake home on their clothes can harm their family and Chris show ray and I as a good example of that fact. A lady sat down, she had a travel agency badge on and poure a glass of wine. She kept listening to our conversation and when she got up I said sorry we talking so medicale, we had been talking about lungs and the damage Ray has. She said she had been so interested as her father died of lung cancer, Ray asked where had he worked and she said, he was in the navy. Well there you are all the Asbestos in the boats it could have been Mesothelioma. Chris yesterday tested me and was asking me what was I doing Christmas and was I planning on lots of camping next year. I was answering away and he said -See last year you kept saying “I dont know if I will still be here, now your telling me you are going to this and that, you have a future and your telling me about it.” so yes I have changed. So it became time to say goodbye and Chris left with the promise of meeting up again very soon. We returned to the Carpark and as usual lost the car. We had walked into the wrong car park of coarse. We retraced our footsteps, we found the car in the other car park and set off for home. 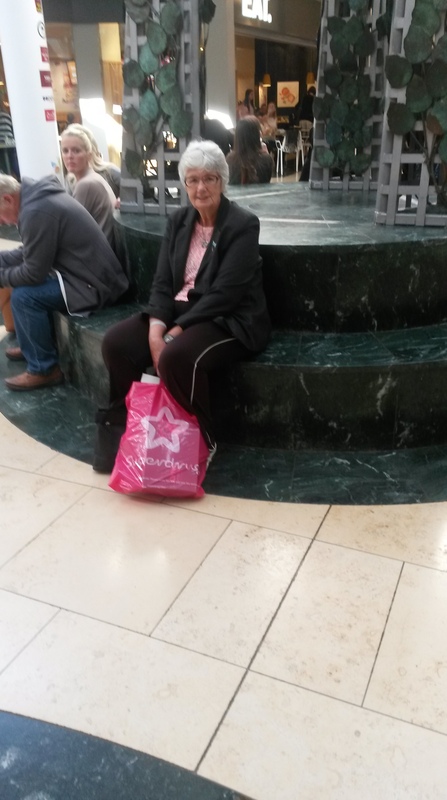 I was all worked up now and wanted to finish my Christmas shopping which I did after dinner on line. Boy so much easier sitting on a computer and shopping. All done now so just wait for them to arrive and we will get wrapping. Ray loves doing that for me as Im hopeless. 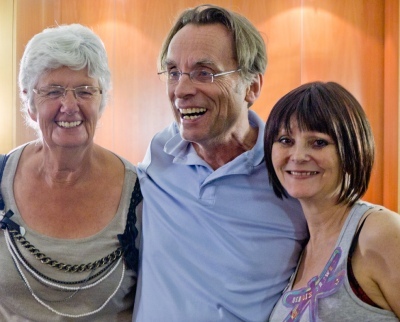 The South African Cape Town, 21 – 24 October 2014 where the 12th International Mesothelioma Interest Group Conference was held – the world’s premier medical congress on mesothelioma. The theme was the ongoing quest for cure. which was hosted by the South African Mesothelioma Interest Group (SAMIG), and held at the Cape Town International Conference Centre (CTICC) situated in the city bowl, with the Table Mountain amphitheatre. This Photo shows Our Mary Hesdorffer of MARF (The Meso Foundation is the only national non-profit organization dedicated to ending mesothelioma and the suffering it causes.) and our own dear Liz Dawlinson of Mesothelioma UK.I admire them both and they are always there at the end of an email when ever Im stuck for an answer. Im here when they need to know about The Patient. Mary is a nurse practitioner with over 16 years of experience in mesothelioma treatment. She is an expert in clinical trials for mesothelioma and her work has been published in a variety of scientific journals. Mary serves as the executive director of the Mesothelioma Applied Research Foundation. Liz trained at Charles Frears School of Nursing in Leicester qualifying in 1986. Since 1992 she has been based within the cardio-respiratory directorate of the University Hospitals of Leicester at the Glenfield Hospital site. Liz was a ward sister/manager in respiratory for several years and in June 2000 she took up the post of Respiratory Nurse Specialist (Lung Cancer). Liz’s interests within lung cancer have always focused on developing the nursing contribution, within the multidisciplinary team, to improve patient and carer experience across the whole cancer pathway. To meet demand locally and nationally Liz developed an interest in Mesothelioma which resulted in the establishment of Mesothelioma UK, the National Macmillan Mesothelioma Resource Centre. Liz is currently a Consultant Nurse leading the development of Mesothelioma UK. In 2007 Liz was awarded the Nursing Times Cancer Nurse Leader of the Year Award sponsored by the Royal Marsden NHS Foundation Trust. 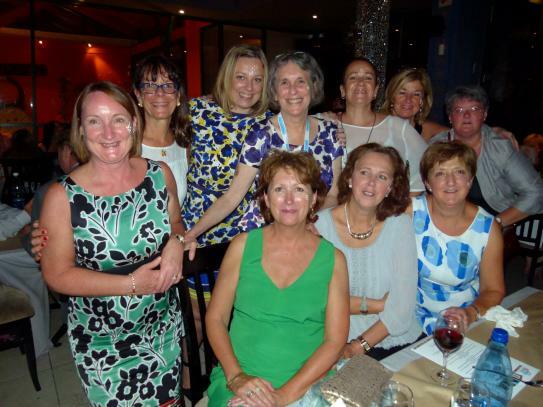 Liz is a member of the National Lung Cancer Forum for Nurses committee and represents nursing on a variety of national and professional committees. Liz is a co-founder and current committee member of the International Thoracic Oncology Nursing Forum. Liz is a module leader and regularly lectures within the Royal Marsden School of Nursing and Rehabilitation and is an Honorary Lecturer at DeMontfort University, Leicester. Prof Dean Fennell (see here with ADAO Lind Reinstein ) was there of coarse and he is the next President of IMIG,so I will love to be there at the 2016 conference. Everyone knows how I admire Dean as he has dedicated his life to Mesothelioma. There are some wonderful young men who have studied Mesothelioma and are so involved in finding the treatment. Then then there is the Passion of Lord Saatchi The Medical Innovation Bill will help doctors to innovate new treatments and cures safely and responsibly for cancer and other diseases. We are so lucky in the UK to have such interest in our Cancer units. Living With Mesothelioma -My Diary- Steve is having a rough time and Calendar is all set up for Go. 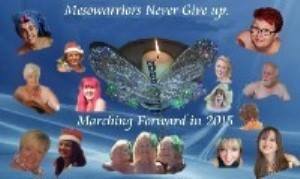 Its been manic on Facebook and yesterday I add so many people into the Mesowarriors groups. What is happening is it because we are making people so aware of us or is the a surge in victims of the disease. I like to think we are making people so aware of our wonderful Facebook Groups and they are seeking info from us. We are the experts as we have all the knowledge at the frontline. I should say the battle line as it is a huge battle. One for the need of knowledge first, when diagnosed, the where can we be treated, where are the trials etc etc. I saw my disease and things changed for me. I knew what I was fighting and no matter what happens with my disease shrinking the damage to my Lungs cant be mended. Im really noticing now its winter that I get breathless on walks. I have to stop and recover. But I do it everyday as I need the exercise. Life has become so busy on Facebook as we get the word out about our fund raising Calender. There are so many calenders where people have bared all for charity that there is a competition for the best one. We are now searching for 2015 naked charity calendars. The critieria are simple. It must be for a good cause, so any deserving charity would fit the bill. The photographs must be of good quality. And the photograher must be happy for us to use the naked charity calendar images in the magazine. I think we have been very coy and based it on the original one. There is so much interest we are having loads of fun with this on Facebook so it has really cheered everyone up. 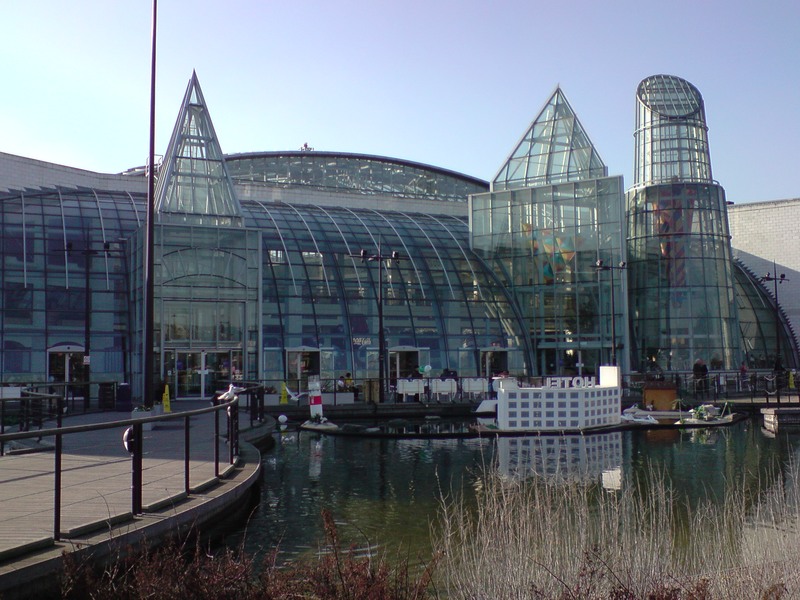 Off today to Bluewater where I can do some Christmas shopping and to meet Chris form IATP. He was the one who presented me with an award 2 years ago. Looking forward to meeting him and having a laugh as we both love camping. There are so many calenders this year that a competition has been started so of coarse we have entered. But we have got our lovely girls as well. So life can return to normal. Our community of Meso Warriors have launched a “cheeky” calender campaign today, yes they have bared all to raise awareness and raise money for research! Please support and purchase your 2015 calender.. We can all help beat Mesothelioma. Meso Warriors baring all for the Jane Hancock Mesothelioma research Fund. Mesothelioma is a non-curable cancer caused by asbestos. Asbestos is still everywhere in buildings, schools etc that were built before mid 70’s. More and more new diagnosis is happening on a daily basis. We haven’t reached the peak of people contracting mesothelioma, PLEASE support and buy a calender and help us to to help research to stop unnecessary deaths. There is a cure; we just have to find it! So we have to sit back and wait for the orders to come in. We had a small start yesterday so hopefully that will grow but we have had a lot of fun and amusement behind the scenes so that has been a great thing to have happened. Saatchi Bill wrote on Facebook — Thanks to everybody for all your support today. It was a fantastic debate and we have now moved through to the report stage. Lord Saatchi will host, as suggested by several in the debate, a round table session to ensure the Bill is in the best possible shape before reaching the other place. One part I was very interested in and thats the University of Oxford keeping a central Database and a Register of Innovations.Amendment 15, in the name of the noble Lord, Lord Turnberg, would require the results of innovation carried out in reliance on the Bill to be registered or recorded. This is a most important amendment and I can certainly assure the House that I have great sympathy with its aim—it has been our aim from the beginning. I explained at Second Reading that we strongly believe that the Bill should be used to generate useful data about innovation. We agree completely with what the noble Lord, Lord Turnberg, said: if the Bill were successful in its aims and encouraged innovation, what would be the point if no record of the innovations was kept in an open, transparent and fully disclosable way to show that the claims that we make—that the Bill will advance scientific knowledge—were true.I expressed delight, which I repeat, and gratitude that the University of Oxford has expressed a willingness to facilitate a central database. It is prepared and willing to do that, and it considers it very important, as we all do, including the noble Lord, Lord Turnberg.I have been convinced that the medical profession has the mechanisms in place to allow a database to be established without statutory authority. That of course leads to the question of whether this requirement should or should not be on the face of the Bill. I have been convinced—and the Minister will say more about it—that the regulators can use guidance and other forms of professional regulation to ensure that the database is used. I would have been happy to include it in the Bill but we must hear the views of the Minister. I am sure I can say to the whole House with confidence that the Government share my view and that of the noble Lord, Lord Turnberg, that the keeping of a register of innovations is a most important part of what is claimed to be the merit of the Bill.